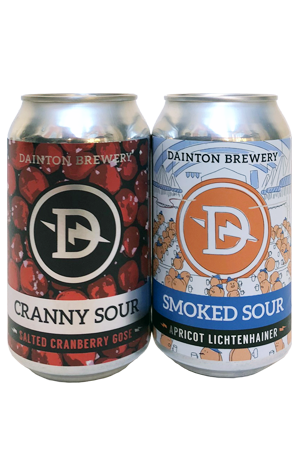 There appears to be nothing that's off limits for the eclectic production line at Dainton, with everything from sours to barrel aged beers to big Belgians to lolly spin-offs and IPAs coming thick and fast. Among the spring 2018 splurge are these two sours that are rather different in nature. Cranny Sour is a salted cranberry gose, one with the faintest hint of colour from the fruit that has it looking somewhere between rosé and chardonnay, albeit far from either in character. There's much in the way of saltiness on the nose, alongside the light, sweet berries, while a spritzy carbonation works in tandem with the pretty potent sourness to create a sharply refreshing, reasonably puckering little number. As for Smoked Sour, it's the second Lichtenhainer style beer to come our way from Victorian breweries in the past month, this one adding apricot to the mix and claiming to have started out as "a threat to naughty brewers". It's a hazy pale golden pour with a finely beaded white head of the sort you rarely seem to find on sour beer styles, with smokiness leading the way on the aroma and the fruit and tang coming to play increasingly on the palate.